November 17, 12 p.m. (noon) to 1 p.m.
How beautiful is an r-squared of 0.95 for a regression line? How puzzling are a bunch of outliers on a distribution plot? How frustrating is a model misfit? When scientists look at their data they not only think, they also feel. Those emotional reactions are the fuel that energizes the big moment, the moment of discovery. Can scientists convey those emotions to their audiences? In this brainstorming seminar, we’ll explore ways to present accurate scientific data that fosters emotional responses in scientific and non-scientific audiences. We will bring scientists from across campus using new data visualization techniques to promote a more holistic perception of scientific evidence (encompassing the rational and emotional). We will initiate a discussion about not only the process of incorporating these concepts into science communication but also about the implications of engaging in emotional interactions with the audience when discussing science. Friday, November 4, 2016. Noon to 1 p.m. 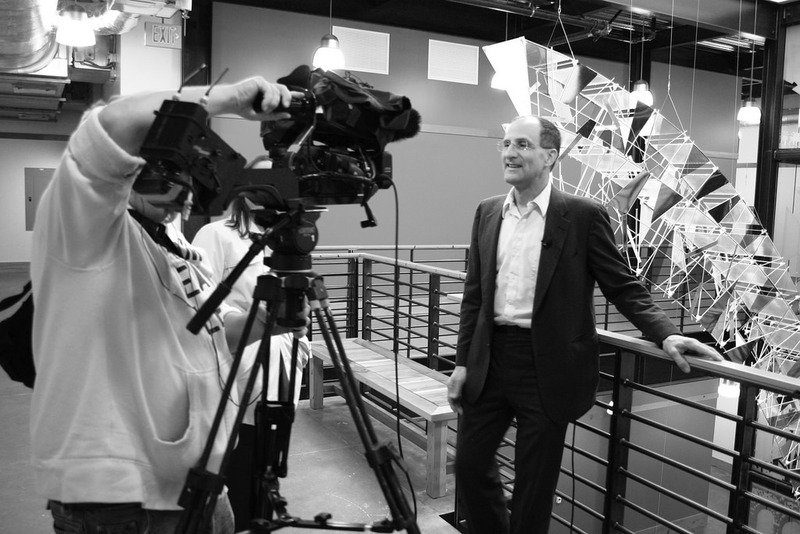 Behind every good story is a good interview. Your questions are the very bones of your story—and maybe the difference between a tale that stands tall or falls flat. In the sciences, asking the right questions is particularly important to ensure complex subjects are told in an interesting and accurate way. Join us for a panel discussion on the Art of the Interview, featuring campus and local writers who will share tips, tales and tricks. Learn about doing the right amount of background research, establishing rapport, framing questions, getting the most out of your subject and learning how to ask follow-ups to cut through complexity. Feel free to bring your lunch and your questions! And so begins one of my absolute favorite stories to tell. I’ve told it many, many times—to co-workers, friends, neighbors. My two young daughters love this story and ask me to tell it again and again. As a marine ecologist, when I tell someone what I do for my job they often have a lot of questions. What does it feel like to be under the ocean? Have you ever seen a shark? What’s all this I hear about [pollution/climate change/the oceans turning to acid]? There are lots of ways to answer these questions. In my greener days, I might have rattled off a 5 minute description of the types of data I collect. Or a research study I had recently read about. I’ve even honed a 30-second “elevator speech” about my research. It wasn’t until recently that I thought about the power of telling a story. At a meeting of science communicators in 2014, I had the great pleasure of watching a group of scientists tell stories in “stand-up” mode. Just them, a stage, and a microphone—not the typical scenario for those of us who spend the majority of our time staring through a microscope or counting fish. Their stories were funny, moving, and exciting. Each scientist connected with the audience on a personal level. The event, with science storytelling training by The Story Collider, was a hit. As I boarded the plane home, I kept thinking about science stories. What if I started answering those questions I was always asked by telling a story? And what if that story was not only a cool anecdote about something I had seen, but a story with a message? There are many others who are asking the same questions. People who are doing research on how your brain reacts when it hears a story. Who are asking how storytelling can build bridges and help us appreciate the “why?” of science. 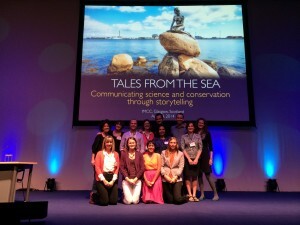 Scientist storytellers at the 2014 International Marine Conservation Congress in Glasgow, Scotland. These thoughts expanded as I talked with friends and colleagues at COMPASS and Smith Conservation Fellowship Program. Some of us do research that takes us into places where most people don’t go—like coral reefs. And some of us have seen changes. Changes we feel others should know about. 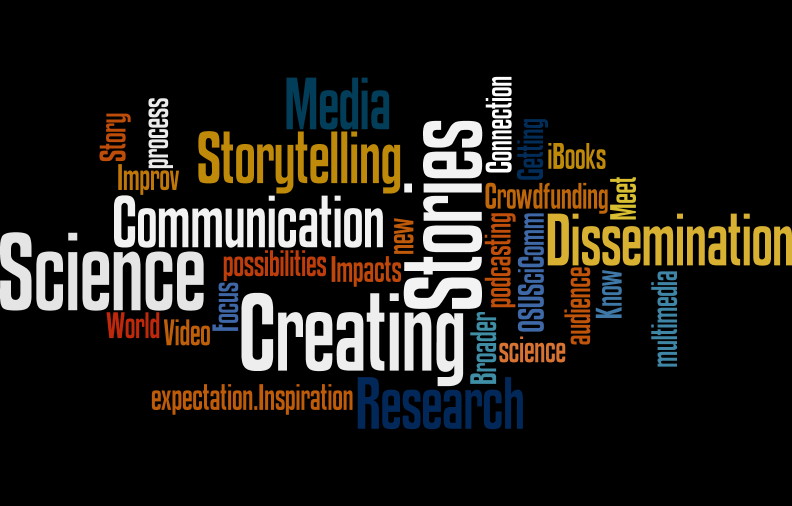 We thought, what would happen if we developed a training that would help us and other scientists use storytelling to share our science messages? These were the seeds of a workshop that was held last summer at the International Marine Conservation Congress, a meeting of marine scientists who are working in a changing ocean. A group of thirteen scientists, conservation professionals, and science communicators joined together for a two-day science storytelling boot camp. We talked about how to tell a good story and how to weave science into that story. I’m now thrilled to share a website that hosts some of those stories. This is a small project, but one that I hope will grow. I hope more and more scientists will share what they’ve found through stories. And I hope we’ll continue to use this great tool to tell others—more than just other scientists—what we’ve seen. Whether you are applying for funding, telling a family member about your research or engaging the public, your success will depend on how well you communicate. Persuading people that your research should be prioritised and funded relies on being a solid negotiator and developing political nous; but these skills are also rooted in communication. One way to do this is by challenging yourself to summarise your research in a short, sharp, three-minute elevator pitch, or ‘flash talk’. What is a flash talk? A flash talk is a challenge in which you have just three minutes to present a scientific concept or idea in an accessible manner. 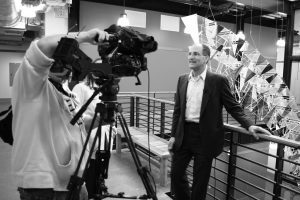 They are aimed at non-specialist audiences and usually happen in front of a live audience or a group of colleagues. There are lots of competitions for flash talks that you can get involved in, such as FameLab and Three Minute Thesis. By convention people don’t use PowerPoint; all you have is the stage, your voice, and perhaps a prop or two to liven up the presentation. In those three minutes, your aim is to inspire the listener and help them to learn about the area of science that you are presenting. There are a number of ways to do this effectively. The following are my top ten tips for delivering a flash talk that is clear, concise and charismatic. See if you can spot some of these features in the videos included in this guide. SciDev.Net joined researchers from across Latin America at a Partnerships for Enhanced Engagement in Research (PEER) event, run by USAID’s US Global Development Lab. Researchers from this programme participated in a short flash talk competition in March to develop their science communication skills. In this video, Djuke Veldhuis identifies the key features of an outstanding flash talk, using footage from the PEER forum in Lima as examples. Ask yourself questions about your audience Who are you talking to? Where are they from? What is their professional background? Do all members of your audience have the same background? How much do they already know? Research your audience, and tailor your talk to their interests and understanding. Be aware of cultural sensitivities and traditions Discussing abortion in a country where it is outlawed on a religious basis will be met differently than in a non-religious setting. Similarly, a group of vegans may react differently to a discussion about animal research than a group of medical students. Observe your audience while giving your talk React to them. Are they laughing and engaged, or yawning and looking bored? If they seem uninterested or unhappy, can you modify how you are speaking to get a better reaction? Learn your starting lines The pressure of getting on a stage and getting ready to speak to a group of strangers can be daunting. Don’t memorise your whole talk, but know your starting lines so you can start in a clear and confident manner. Place ‘stepping stones’ Create three or four key stepping stones or check points that you can use to progress through your talk. These might be places where you introduce a new idea or move to a different time or location in your story. Craft the ending Endings such as “That’s it, thank you” or “I’m out of time” can seem sloppy. Try to have a couple of lines memorised which broadly summarise your talk. That way, if you get cut off or time runs out, your talk appears complete. Round it off A good way to finish your talk can be to come back to a starting question or statement. For example: “And so the evidence is clear: solar panels are the answer to our impending energy crisis.” A strong message like this will naturally indicate the end of your talk and remind the audience about your objective or key message. How is your research relevant to the audience? People will be more interested in your talk if you’ve made it relatable. Human interest Make your audience care by bringing out how your research impacts on people. You can reference a person’s story or use a powerful quote. Example: This story from SciDev.Net asks local women from Colquencha, Bolivia, how food security initiatives have affected them. Application Perhaps you can give specific examples of how your research will be used in a real, tangible way in the future. Example: This story from SciDev.Net explains how big data will help coffee farmers adapt their practices in response to climate change. Involve the senses Your talk will be more relatable if you can involve the audience’s senses or daily experiences. Tactics include giving an inanimate object a personality or feelings, or describing what it is like to touch, feel, hear and smell something or to be somewhere. Example: Asking the audience to rub their hands together to explain how friction generates heat, or talking through particle physics by visualising the movement of particles in the preparation of a cup of tea. Think of your favourite film or book. How do they captivate you? Stories are enormously powerful and introducing some of their elements into your talk can make it more effective. Characters Characters in stories give your audience more to relate to or care about. Your audience will want to know what happens to the character. A crisis or dilemma You can present opposing views in a debate — ideas that contrast with each other. Such oppositions can create surprise or suspense. If you can offer a resolution to the tension or opposition, your talk will be more memorable. Structuring your talk like a story This is a highly effective way to communicate in a clear, structured manner. It also allows you to be more dynamic and flexible by, for example, allowing you to include recent news stories or new data if you change your story slightly. The stage is yours By commanding the space in which you are speaking you will appear more assertive, which increases your confidence. Use the whole stage Moving around the stage allows you to involve the whole audience (for example, those sitting at the sides) and makes them feel more engaged. Get closer You can move to the front of the stage, addressing the audience as if you are telling them a secret. This will have a greater impact than if you stand locked in the same position for your entire talk. Don’t hide Avoid ending up behind physical barriers, a costume or even a loud voice. It might feel safer to stand behind a lectern, hide behind paper notes or stand at the back of the stage behind a ‘wall’ of empty space. But these all create a barrier between you and the audience, and hinder effective communication. The following is advice from some of the finalists at USAID’s PEER forum in Lima in March 2015. Nearly 50 researchers prepared and delivered flash talks. The researchers themselves chose the finalists, based on talk content, clarity and charisma. An external panel then judged the six finalists. Match your body language to the content Your talk will lack impact if you are talking about the biggest volcanic explosion in human history by speaking quietly with your arms across your chest and eyes staring at the floor. In this instance moving your arms and opening up your body while moving across the stage will do more to reinforce your message. Express emotions Humans are pattern recognition machines; if you act surprised by something you are speaking about, the audience are likely to mirror your emotion. This will make them more receptive to your words and ideas, and strengthen your point. Ensure your audience is focused solely on you and the content One way to achieve this is to avoid fiddling with keys in your pocket, the microphone cable or rocking nervously on your feet. Remove other distracting habits These can be physical or verbal (for example, repetitive word use, such as “uhm”, “like”, “literally” or “so”) or waving your hands excessively. If possible, record yourself when practicing to identify habits, or simply ask friends or family to spot them. Feeling nervous? Build confidence by faking it or even taking on a ‘power position’ beforehand. For example, standing for two minutes with your hands in the air or on your hips has been shown to decrease stress hormone levels and increase testosterone, which is associated with confidence. Breathing exercises, tensing and relaxing muscles, and meditation are also recommended. Good speakers follow all the points listed above. Great speakers are always asking for honest feedback from talk organisers or trusted colleagues. They add, delete and tweak their presentations based on feedback. This might be the use of a single word or turning the order upside down. The rap artist Baba Brinkman nicely illustrates this while communicating some concepts in evolution. Plan how you will say it Your voice is a powerful tool. You can modify lots of aspects of your speech: pitch (high/low), intonation (variation in pitch indicating emotion and attitudes, or the difference between a statement and a question), pace (fast/slow), volume (loud/soft) and emphasis. Using these will ensure you avoid a monotone delivery. Use the active voice Present your talk in an active voice (Juliet loves Romeo) rather than passive voice (Romeo is loved by Juliet). The active voice is often easier to understand, clearer and fits well with content structured as a story. Using a prop or object can help A prop can be anything from an enlarged model of a molecule or classic science demo to an object, animal or piece of technology relevant to your talk. This might help make it more memorable.a) Make sure the object is large enough to be seen by the whole audience, if not use a hand-held camera and screen to show it. b) Only use a prop if it adds to your talk, not as a gimmick. c) Cover or hide the prop when not in use, otherwise your audience might be distracted by it while you want them to be listening to you. Having it covered before using it might add suspense. My advice is to run your talk by a family member or close friend with no specialist background in the topic — people who will give you frank advice about how understandable and engaging it is. Materials and resources on how to make scientific ideas compelling. The seminar includes audio and video examples. This site has a wealth of practical advice for a wide range of public engagement formats, including flash-talk-style presentations. Online course taking you through a series of exercises to develop your presentation skills with a particular focus on speech. Each section has videos to illustrate the exercises. Ten pieces of advice for how to use props effectively in a presentation. FameLab is a communications competition designed to engage and entertain by breaking down science, technology and engineering concepts into three-minute presentations. Contestants from around the world take part armed with only their wits and a few props that they can carry onto stage. The result is an unpredictable, enlightening and exciting way to encourage curiosity and find out about the latest research. Visit their page to see examples of these presentations. Three Minute Thesis (3MT®) celebrates the exciting research conducted by PhD students. Developed by the University of Queensland, the exercise cultivates students’ academic, presentation and research communication skills. The competition supports their capacity to effectively explain their research in three minutes, in a language appropriate for a non-specialist audience. The site has a wide range of examples from participants. Julio Cañon’s flash talk was chosen by the judges as the most complete in terms of content, clarity and charisma during a regional science symposium in Lima, Peru. The meeting was convened by the US Agency for International development (USAID) in March 2015. His talk was one of six short-listed for the final by other researchers taking part in the forum. Djuke is a Marie-Curie-COFUND research fellow at Aarhus University in Denmark where she looks at human adaptation to stress. She has written for New Scientist and worked across Southeast Asia as editor of ResearchSEA magazine. Most recently she was FameLab Manager at Cheltenham Festivals working alongside the British Council and NASA to discover charismatic, up-and-coming scientists who can inspire people to see the world from a new perspective. If you can’t make it, feel free to provide input and feedback using the form below or email Naomi Hirsch @ OSU. © 2019 Science Communicators, all rights reserved.